The company has started mass producing its fast and frugal LPDDR4 mobile DRAM. Samsung Electronics has started mass production of the industry's first 8 Gigabit LPDDR4 Mobile DRAM. The improvements will be possible thanks to Samsung Electronics' 8 Gigabit LPDDR4 (low power, double data rate) mobile DRAM. The smartphones will also get better UHD (ultra-high definition) video recording and playback capabilities, thanks to the chip's ability to move data at rates of up to 3.2Gbps, Samsung said on Tuesday. 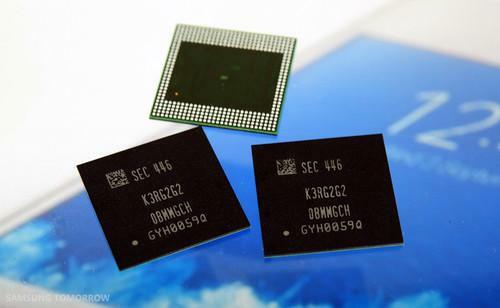 The improvements aren't just about increasing speed: low operating voltages and faster processing will also result in power savings, according to Samsung, which bundles the chips up into packages containing 2GB, 3GB or 4GB of RAM for smartphone and tablet manufacturers. Exactly what the manufacturers will choose remains to be seen, but anything below 3GB on a high-end Android-based device that's launched during the first half of next year would be very surprising. Recent products such as the Google Nexus 6, Sony Xperia Z3 and Samsung Galaxy Note 4 have 3GB of RAM, and successors to the HTC One M8 and Galaxy S5 should follow in their footsteps. The memory type is compatible with Qualcomm's octa-core Snapdragon 810 processor, which is expected to power many high-end smartphones launched in 2015.